When small jellyfish-like hydrozoans, Turritopsis dohrnii, are faced with food scarcity or other challenges, they don't die. They get young again. Normally the organisms reproduce like grown-ups with sperm and eggs. In case of emergency, though, a bedeviled bell sinks down and the blob of tissue sticks to a surface below. 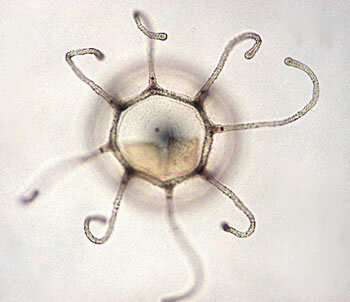 There Turritopsis’ cells seem to reverse their life stage. When the blob grows again, it becomes the stalklike polyp of its youth and matures into a free-floating bell all over again. “This is equivalent to a butterfly that goes back to a caterpillar,” Maria Pia Miglietta of Pennsylvania State University says. SF fans enjoy thinking about the idea that an intelligent, space-faring species might achieve immortality through regrowth. Time Lords from the Dr. Who series also have the ability to regenerate their bodies when their current body is mortally wounded. This process results in their body undergoing a transformation, gaining a new physical form. From Science News via daily galaxy; thanks to Moira for the tip.